AURELIAN, a monk and later Abbot of Ainay (Abbey of St. Gregory of Tours) in Lyons. St. Aurelian later served as 47th Archbishop of Lyons from 875 until his repose in 895. BERTHA, a daughter of Count Rigobertus and Princes Ursanna of Kent. Following the repose of her husband in 672, St. Bertha founded and served as first Abbess of what was later known as the Abbey of St. Bertha of Blangy in Artois. Towards the end of her life she resigned as Abbess in favour of one of her daughters and spent the rest of her life as a hermitess in the abbey. St. Bertha reposed circa 725. FINBAR, a sixth century Abbot of Innis-Doimhle (most likely present-day Inch, Co. Wexford), Ireland. Butler describes him as the founding abbot of a monastery on the Isle of Crimlen, between Hy Kinsellagh and the Decies of Munster. He also cautions us not to confuse this St. Finbar with St. Finbar of Cork (St. Barr 25th September). HATTO, a Swabian noble who, upon reaching majority, donated all his property to the Abbey of Saint Alexander of Bergamo in Ottobeuren in the Bavarian Allgäu, and received monastic tonsure. St. Hatto spent the rest of his life as a monk at Ottobeuren, reposing in 985. JUCUNDIAN, (Date Unknown), a martyr in North Africa, of whom nothing is known save he was martyred by drowning at sea. LAURIANUS, (LAURIAN), the extant information on St. Lauianus is completely unreliable. However, according to tradition, he was a native of Pannonia, who was most likely ordained to the deaconate in Milan, and later served as Archbishop of Seville. He was probably martyred in Bourges. The head of Saint Laurianus is amongst the relics venerated at Seville. NAMPHAMON ('the Archmartyr') and COMPANIONS, an early (circa 180?) 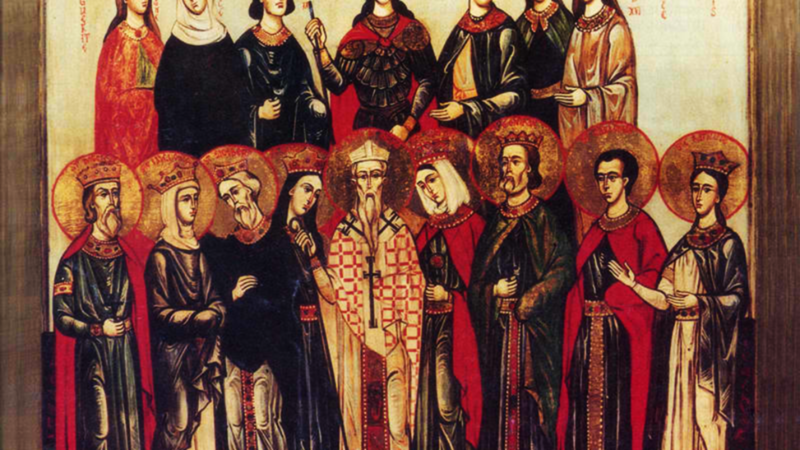 group of martyrs at Madaura in Numidia in North Africa, often counted as amongst the first to be martyred in that region. The name Namphone is of Punic or Carthaginian derivation, however, no further firm information is extant. PROCOPIUS of SÁZAVA, a native of Bohemia, who lived for some time as a monk somewhere in present-day Hungary. St. Procipius returned to his native Bohemia circa 1029, living at first as a hermit in the Sázava Valley. His holiness and wonderworking soon attracted many disciples. With a local nobleman as benefactor, St. Procopius founded a monastery, and served as its founding Abbot until his repose in 1053. ULRIC (ULDARICUS, UDALRIC) of AUGSBURG, a native of Augsburg, who was educated at St. Gall in Switzerland. St. Ulric, having been nominated by Henry the Fowler, was consecrated Bishop of Augsburg on 28th December, 923. During his episcopacy, St. Ulric was an indefatigable pastor, visiting the sick, building churches, and caring for his priests. St. Ulrich courage and leadership served his See well when faced with Magyar invaders, rallying his flock to hold off the Magyars until the arrival of Emperor Otto and his troops. In 971, after nearly a half century as primate, St. Ulric resigned his See, and with the Emperor’s consent appointed his nephew his successor. The appointment was subsequently ruled un-canonical, and St. Ulric was charged and convicted of nepotism, for which St. Ulric apologised and did penance. St. Ulric reposed on 4th July, 973. He was canonised on 3rd February 993 by Pope John XV; the first western saint canonised by the Pope of Rome and not a local council, serving as the foundation of the church of Rome’s canonisation process of today.